Sridharan, son of Mr. Kumarasamy and Mrs. Marimuthu is now 6 years of age. It was very upsetting for the parents when they found that, their lovely son was affected by CHD. This happened when he was 3 years old. Doctors who found the abnormal heart beat of Sridharan, requested them to take tests and confirmed the illness. Doctors asked the family to wait hopefully as they had an opinion that the defect might get cured as the child grows. Years went on, and Sridharan was completely on medications. He was regular to school. 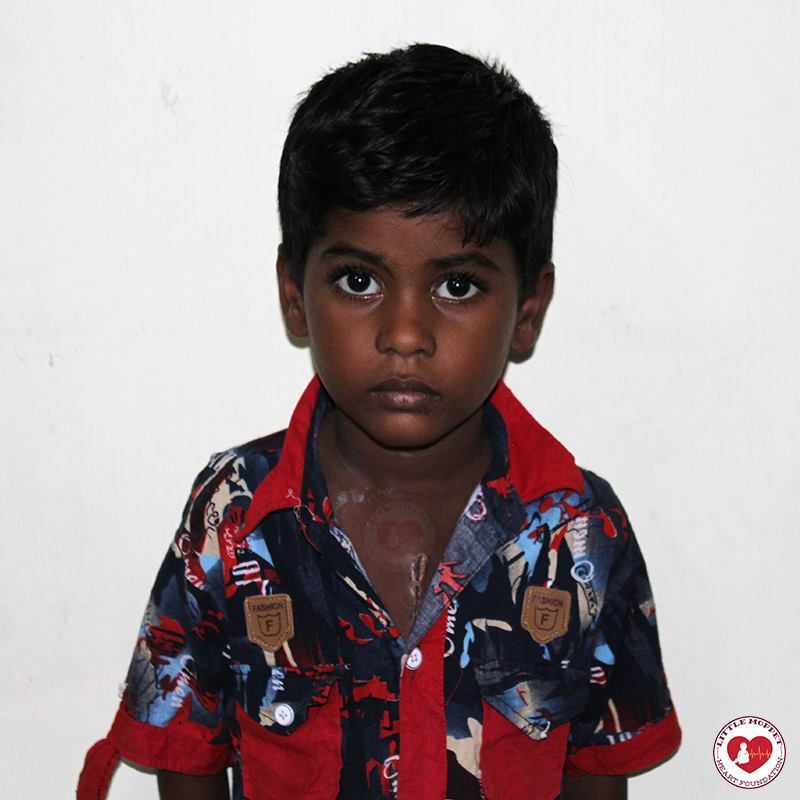 During one of the medical camps conducted at his school, the team informed Sridharan’s family that the surgery has to be done as soon as possible. Sridharan’s parents were farmers with a minimal income to lead the family. They checked in few places for support but couldn’t take it up as the government insurance scheme (Amma kaapeedu thittam) was not up to date. They were clueless about the next step. At that moment they came to know about Little Moppet Heart Foundation. The panel headed by Doctor Gopi examined the little boy and made all the arrangements for surgery. Parents were happy that everything, about which they were clueless once went on smoothly now, without any expenditure. Surgery’s expenditure was completely taken up by the kind hearted donors. Now we are able to see the healthy smile of the little prince Sridharan. Our heartfelt thanks to the donors, who are helping to make things happen.